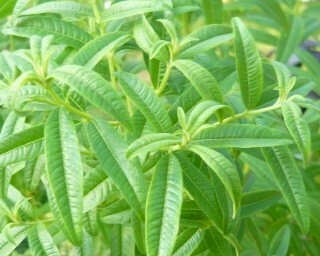 Lemon Verbena - Long slender green leaves have a remarkable sweet lemon scent and flavor. Favorite tea herb, other culinary uses include use in salads, jams, jellies, fruit drinks, meat dishes, etc. Forms a small woody shrub in warm climates. Can be overwintered indoors with adequate light. *Verbena are prone to drop leaves when exposed to extreme temperature changes. Perennial zones 8-10. Live starter plant in 3 inch container. When I moved house a few years ago, my brother came to help me shift those items that I wasn't trusting to the movers. He fussed a bit when he learned I wanted us to move my potted garden, asking why I didn't just let the movers take them and replace any that died later - until he shifted the huge lemon verbena I had growing in a large 16 inch pot. He was absolutely smitten by its scent, and I fixed him some tea from it later that evening, and he was completely won over. A few weeks later I heard him telling others that it was worth moving all the other pots just to discover that one plant. Yes, as part of my thank you for all his hard work, I gave him his own lemon verbena plant. I have just purchased of 25 herb plants from this Nursery including this Lemon Verbena plant. Nice lemony smell and taste I am sure this will grow into my favorite shrub. I buy herbs from many Nursery's Colonial Creek is the best ever. Every herb arrived in perfect shape well established and very healthy and a great size ready to transplant and take off growing. Love these people, plants obviously were grown and cared for with a lot of TLC. I normally would not take the time to comment on every plant purchased but this Nursery deserves it. And the price is a true bargain for the quality. I Highly recommend this grower.